Black Friday - Scan a QRickit to win a prize! 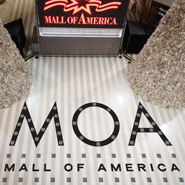 Mall of America has a display that features a design using its logo and 100 QR Codes. The first shoppers who come in on Black Friday can get a chance to scan the QR Codes to win prizes ranging in value from $25 to $1,000 and including items such as shopping sprees and gift cards. The campaign's goal is to educate shoppers about QR Codes as well as drive traffic to the mall where videos about how QR Codes work will also be shown. During the holiday season, staff T-shirts and signs featuring QR Codes will give shoppers a chance to win a grand prize for a $1,000 shopping spree. QRickit helps raise funds for childhood cancer! QRickit helps Chili's Grill & Bar raise over $5 million for childhood cancer. See the Create-A-Pepper to Fight Childhood Cancer campaign at http://www.createapepper.com/. QR codes printed on the back of kids' coloring sheets and restaurant table tents directed guests to either a special patient thank you message or to the fundraising campaign website. There have been 291,000 QR code scans. "By incorporating the QR codes into this charitable campaign, it was a great way to relate to Chili’s tech-savvy guests while giving St. Jude supporters another, easily accessible way to donate to the charity," said a Chili's spokesperson.